Here’s to a prosperous and happy 2018! In addition to the usual challenges, achievements and the pace at a busy school, the 2017 journey took us through twists and turns of a scale and nature that we could never have foreseen. Yet, our community responded with grit and compassion that ensured a moral victory over the adversity. One parent mentioned to me that 2017 had been the hardest year in her life but also the one in which her faith in humanity was restored. As a community we can build on the ties that were strengthened in the past year and make the most of 2018. We are pleased that a good number of new pupils and their families are starting their Oakhill journey this term. To these families we extend a warm welcome and best wishes for a happy and enriching association with our school. We are also welcoming six new academic staff members to our ranks. In the Prep, Mrs Felicia du Randt and Mrs Deborah Hayward are joining us to teach Foundation Phase Music and Grade 4 respectively. The new College teachers are Mr John Bothma (Science), Mrs Sonja Victor (English), Mrs Suzanne de Villiers (Maths) and Mrs Rita Harris (Science and Maths). Welcome and good luck! At the start of the year, we all arrive with certain expectations. It is appropriate for pupils, parents and the school to have high expectations of each other in our three-pillar partnership. Parents and pupils are within their rights to expect the school to offer a wide range of opportunities for learning and growth in a safe, secure, well-structured, well-maintained, disciplined, stimulating and encouraging environment. It is appropriate for parents to expect professionalism and high standards from educators, coaches and caretakers. In a privileged context such as ours, parents and teachers should have high, clear and fair expectations of pupils. The minimum requirements should be, ‘invest your best effort’ and ‘have consideration for others’. The school has expectations of parents too: communication, support and involvement without interference. Our expectations of each other are valid when they pass the reasonability test. Schools are places of hope where pupils should be encouraged to dream, dare and strive. The hopes we foster are often not as openly expressed as our expectation. This is because they include our ambitions and wishes, aimed at targets beyond minimum requirement. Sharing these bears risk because we might fail. Yet, I would encourage parents, teachers and pupils to take time at the start of this year to discuss your hopes. We have a much better chance of realising our hopes in a team effort with those who care. The sky is the limit in a community where we sincerely want each other to succeed. The expectations and hopes we carry with us into a new school year have a flipside, of course: fear of failure. It is our human nature to fear ‘What if?’ As with our hopes, it helps to articulate our fears to those who care about us. It is empowering to make peace with the reality that we are not going to get everything right in the year ahead. In our failed attempts lies the opportunity to learn and grow. There is one thing more satisfying than getting it right on the first attempt… it is getting it right on a re-attempt! We are thrilled with the results that were achieved by our matric class. In the challenging year of 2017, this group could have found valid excuses for falling short of their goals. 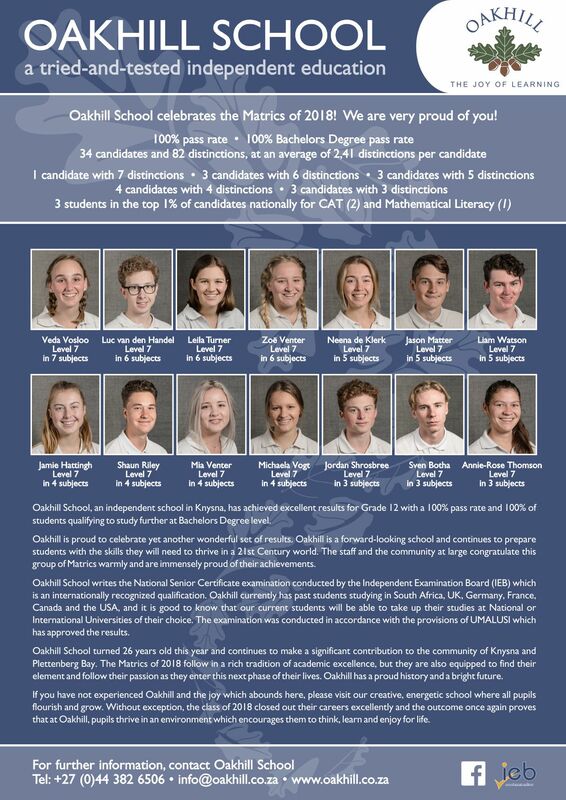 Instead, they shot out the lights by achieving the best matric results in Oakhill’s history and outperforming IEB averages by significant margins. Our Academic Director, Andrew Browne, compiled an insightful analysis of the results, which he shared in a letter to the Oakhill community. You can read this letter here if you missed it earlier. Information on the results of our top achievers is available on the school website. Hats off to all our teachers in the Pre-Prep, Prep and College who walked alongside our matrics throughout their school career. Thanks to quality teachers, our matrics are leaving Oakhill with exceptional matric results but also with choices, competencies, resilience and adaptability to succeed in a changing, challenging world. 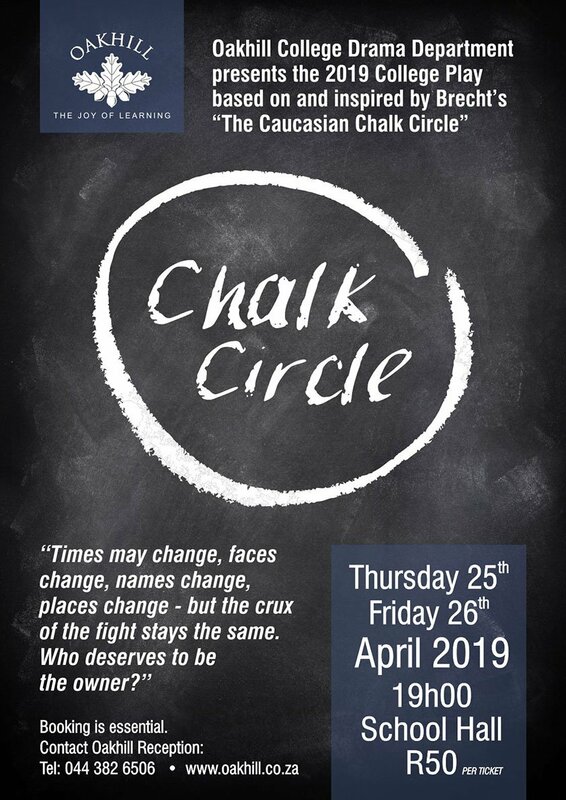 I found it deeply meaningful that the matrics’ farewell gift to the school was a ‘values signpost’ which was installed on the circle at the school entrance. Recorded on the signpost are ten core values this group associated with the education they received at Oakhill: Joy of learning, mindfulness, responsibility, integrity, collaboration, respect, resilience, perseverance, humility and empathy. Do yourself a favour and have a look the next time you visit Oakhill. One of the important goals we have at Oakhill is to be deliberate in everything we do. Our operations and structures at the school should match our intentions as a product of proper planning and should only be constrained by realities beyond our control. This is the ideal and I hope that is will be your experience as a parent, pupil or member of staff this year. You have to remember though that, we are striving for excellence but perfection is not our goal. I wish every member of the Oakhill community a happy and prosperous 2018. Reaching back to where I started in this letter, I want to conclude with the following suggestion, in an attempt to help us all deliver on our expectations, realise our hopes and conquer our fears: Imagine what can happen if we stand together, help each other succeed and don’t care who gets the credit!